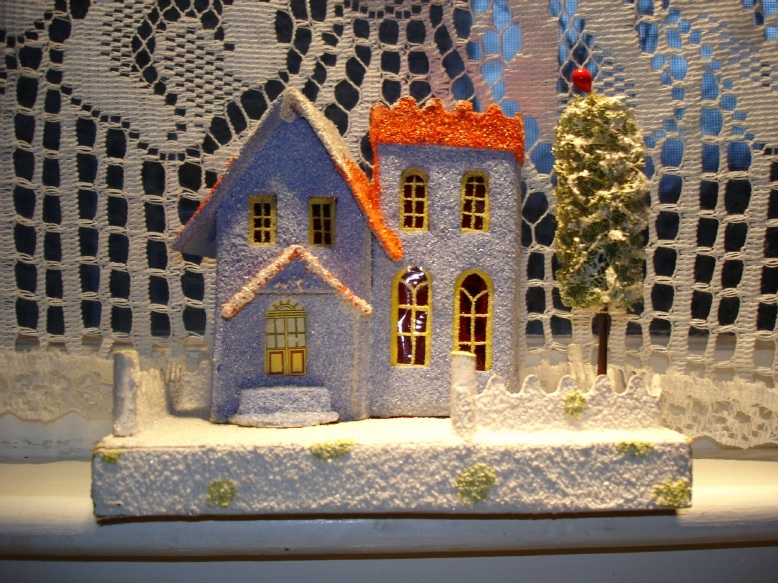 Flocking replacement windows for old Christmas putz houses. Realizing that the original fuzzy windows were probably printed I decided if I could come up with something useful. I had originally intended to carve a linoleum print block for this purpose but lost the one I bought and came up with a simpler method - at least for me. Whatever the Japanese used it was no doubt a tedious if not arcane process. But flocking is not a hard thing to do. Materials and tools you may need are; a straight strip of card ( I cut mine on a paper cutter,) make sure it is not too thick and that the linear sides are parallel; small hobby brush, hobby knife, scissors, pliers and needle nose pliers, a ruler, glue, oil base enamel hobby paint , flocking(available from a hobby store), and a pattern to follow taken directly from the window of the house you are restoring. 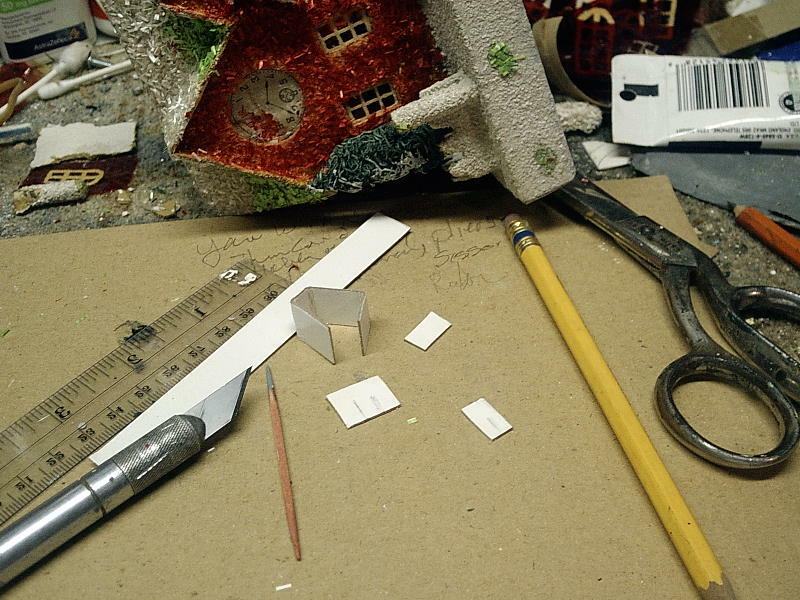 The first step is to measure the length and bend the card. I first scored the card for a more even fold. Also to get sharp corners I crimped them flat with a pair of pliers and then straightened them back out again giving a sharper corner. Then you measure the width and repeat the bending process till the frame is complete. You may have to do some trimming to get a perfect rectangle. For the mullions I measured the INSIDE length and width of the window and drew the slots before cutting. 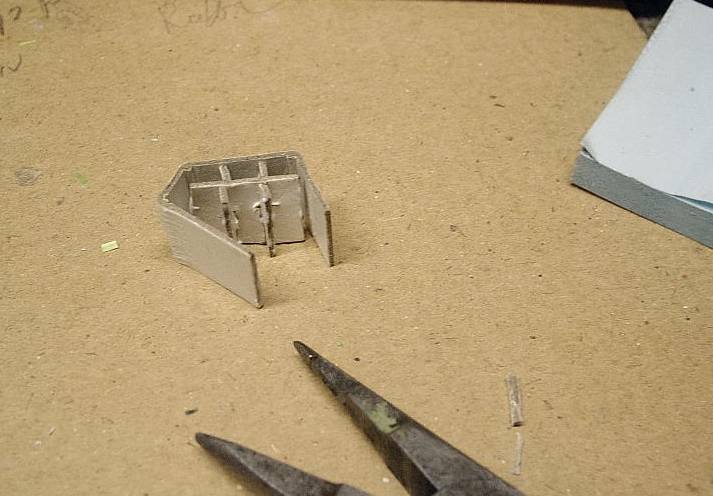 Using a toothpick as an applicator, put glue on the "separators" and assemble. Then put the mullions in the frame and glue holding the window together with a straight pin. As you can see from the above photo the mullions aren't straight. After assembly but before drying you can use the needlenose pliers to straighten the mullions. Since you will be using only one side it is not necessary to straighten the reverse side and could lead to misalignment of the printing face side. 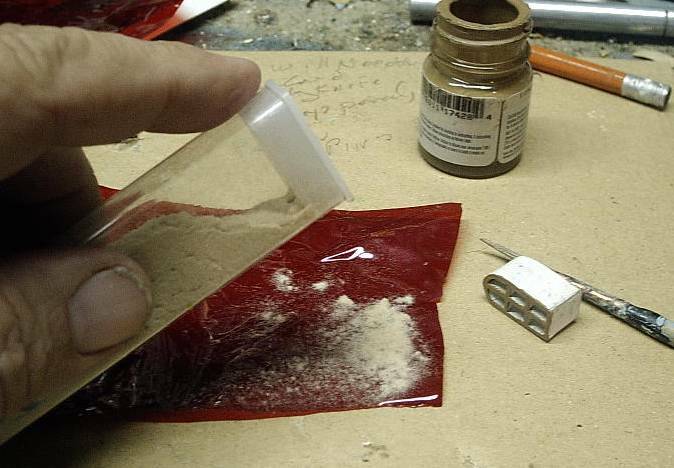 It will likely be necessary to sand down the printing side to even up the printer after it is thoroughly dry. 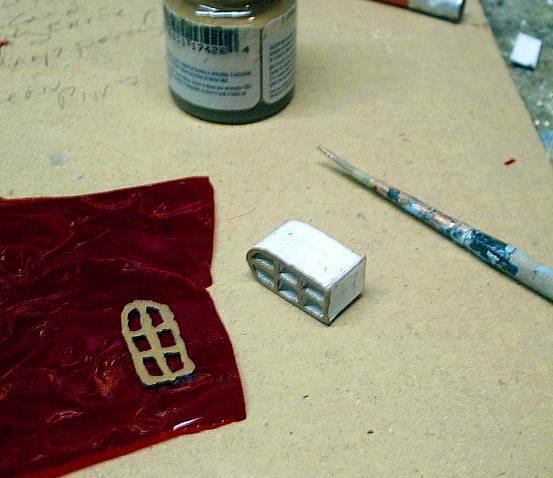 This photo illustrates the technique for applying the paint (oil base enamel) to the printer using a small brush. If the printer misses some spots it can be corrected with a brush. A certain amount of speed is required in doing this so the paint won't set up too much and the flocking will stick. I poked a hole in the side of the plastic flocking container using a small soldering iron, a serendipitous accident on my part. I sometimes pat the flocking down to make sure it sticks well. I usually dump the excess flocking on a small piece of paper and reuse it. If the enamel was a bit to dry you can apply more paint to it and re-flock. It would be better to use a yellow orange paint and apply a yellow orange flocking. However living here in the "hole in the US donut" (Kansas) I was unable to find yellow orange flocking or paint. So I mixed up some yellow orange acrylic enamel thinned down with water and sort of wicked it on the flocked window and then re-flocked. Do NOT attempt to use a waterbase paint directly on the cellophane as it will cause the window to pucker into an unusable state. 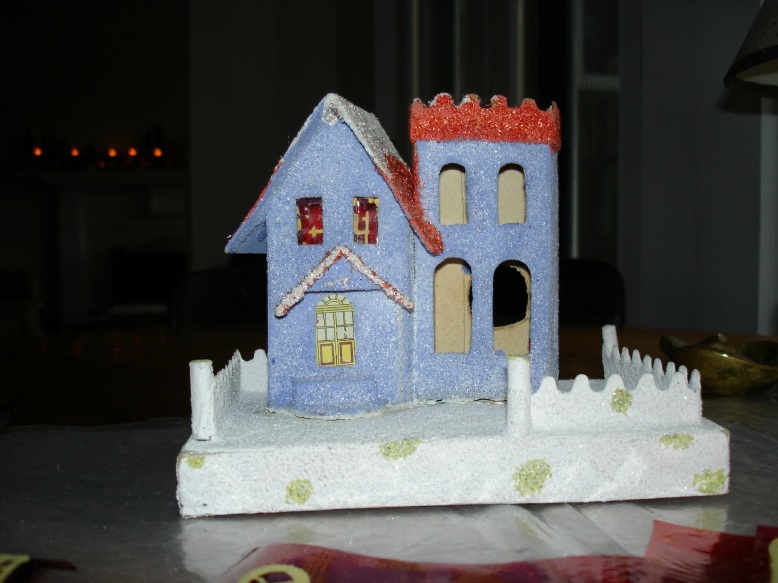 Antoinette's "Ice castle" looked awfully vacant and forlorn at first. 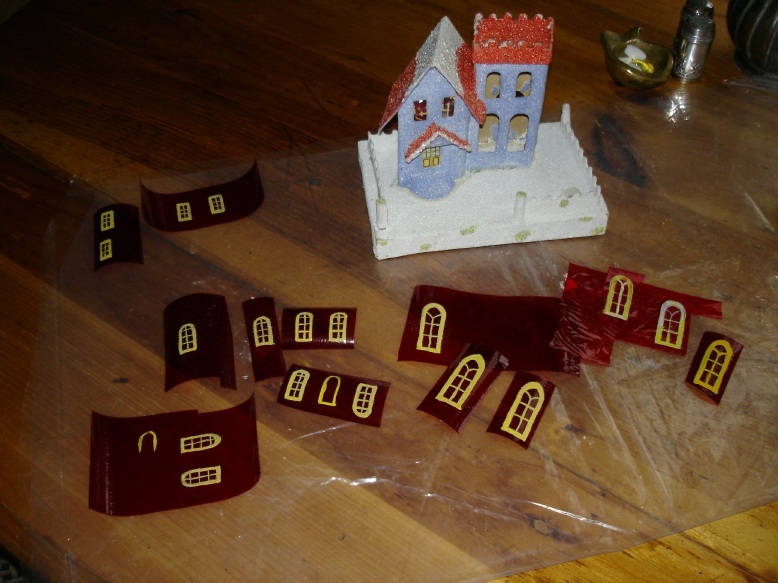 -she aquired some genuine cellophane and laid it over "Papa Ted" windows to trace the line patterns with glue, then sprinkle on the flocking that she got from the crafts shop. Anoinette comments: (Feb.06,'06) "Hey, while you're feeling frisky (this morning after the SuperBowl), could you correct the text under flocking windows for my Ice Castle? 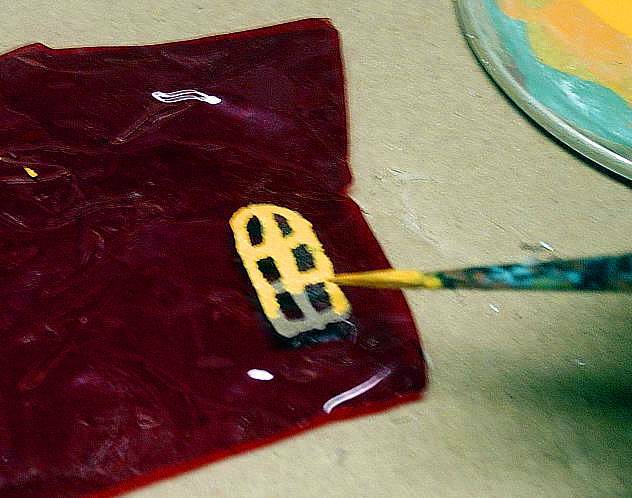 I painted hobby enamel, not glue, onto the cellophane (glue was a big mess and a failure). Plus, I just flipped the wet-painted cello into a dish of flocking and pressed, and it stuck beautifully. (I didn't sprinkle flocking on the wet paint the way Tom showed, because not enough of it stuck that way. Tom had to paint over the mullions more than once using the sprinkle method. Pressing just once works like a dream.)" Looks really good to me! - proving there is more than one way to skin a cat and flock a window.